All attendees are invited to wear red for a group photo to be held at the event. Victoria Harvey, Senior Vice President & Chief Legal Officer, Smile Brands Inc. This program will begin with a live poll and presentation of the state of discrepancies in pay between men and women, both in California and nationwide. 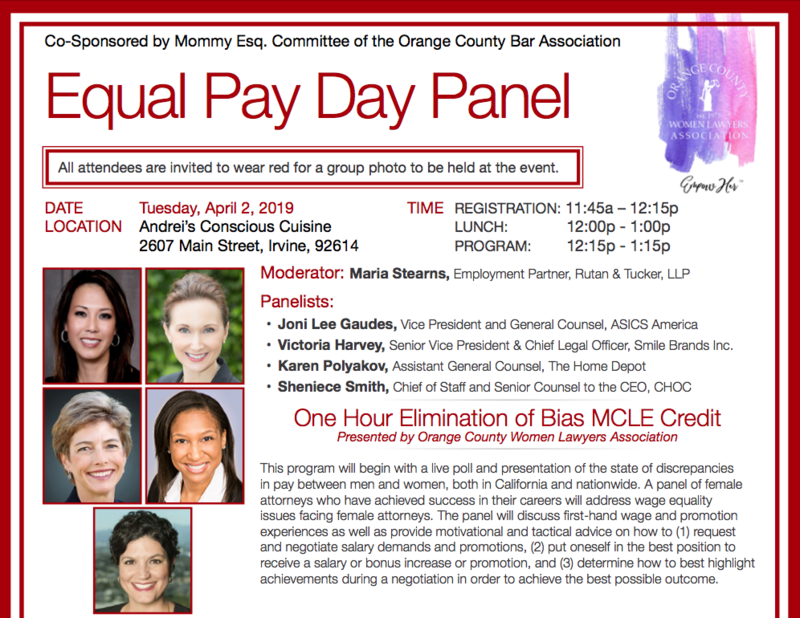 A panel of female attorneys who have achieved success in their careers will address wage equality issues facing female attorneys. The panel will discuss first-hand wage and promotion experiences as well as provide motivational and tactical advice on how to (1) request and negotiate salary demands and promotions, (2) put oneself in the best position to receive a salary or bonus increase or promotion, and (3) determine how to best highlight achievements during a negotiation in order to achieve the best possible outcome. The color of red signifies the deficit women are paid. The date of April 2nd (Equal Pay Day) is the date women would have to work until to get the same pay as their male counterparts did for the previous calendar year.